Gigero is an easy-to-use tool that Spotify offers to help you find concerts and music festivals. Gigero’s polished, easy-to-use website oozes with summer-festival happiness. Even though it’s technically in beta (trial) mode, it still looks very professional. All you do is type in the name of an artist, and Gigero scans Last.fm for gig listings, uses Google Maps to visually pinpoint where those concerts and festivals are, and then delivers Spotify links next to the artists’ names (which appear in a pop-up screen when you click a Google Map pinpoint). You also see links to any other acts also attending the same event. The service’s latest feature, Gigero Embed, lets artists embed a Gigero frame on their own sites to let people know where they’re playing next. 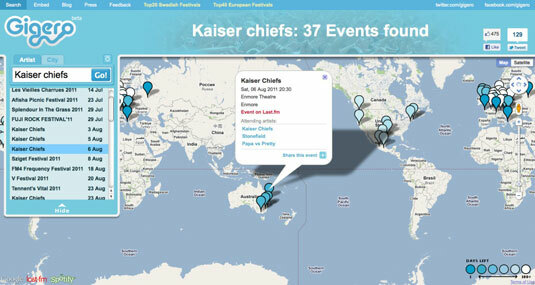 You can also search by city and see all the events that are scheduled, wherever you are. When viewing the Google Map of scheduled shows, you can zoom in to see the exact location of your chosen gig or zoom out to view the artist’s globetrotting schedule from afar. Another nice touch is the color-coded pinpoints — gigs happening sooner rather than later are displayed in a darker blue, and gigs that aren’t happening for several months are lighter, so you can plan your festival frenzy at a glance.